Shoes are in reality designed to meet the real and not-so-real perceived needs of the individual person wearing the shoes. What this means is that shoes should offer protection, support, comfort and sturdiness, as well as the not-so-real need to be stylish from a fashion perspective. Keep in mind an average day of walking brings a force equal to several hundred tons on the feet over time. The feet are subject to more injury than any other part of the body. Unfortunately, the greatest number of patients Indiana Podiatry Group sees presenting with foot problems are related to fashion oriented shoes. Women and men obviously have different preferences in styles of shoes. Women have a trend to choose specific shoes for fashion (whether casually or professionally) and unfortunately, women inflict more force on their feet due to that choice in footwear. 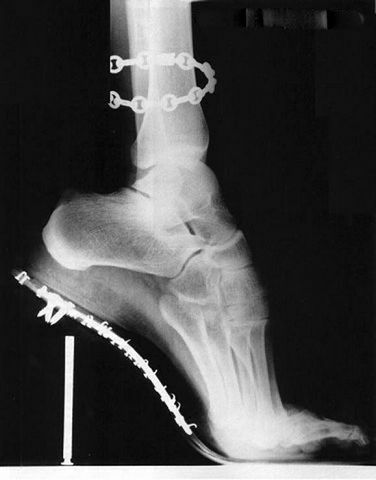 The high heeled shoe is often to blame for this. Some podiatrists believe such heels are not medically stable because the walking pattern of the foot is not naturally flexed downward, a position high heels or pumps force the foot into. Men often tend to choose their shoes based on sports preference and clothing habits, and in doing so seem to choose better fitting and more supportive shoes more often by default. This may be due to men simply having less consideration for what is stylish, but more realistically is probably due to the fact that men's shoes have been designed with more comfort in mind the last several hundred years. However, men can and do make the same mistakes as some women make, and select overly narrow or poorly supportive shoes for the sake of what is trendy. Both men and women have sandals are a common choice in warmer weather. The flip flop is the most universally worn sandal, and essentially is a fashion choice, as in reality the flip flop is a terrible shoe. Since there is little to no material over the foot or keeping the sandal from slipping off the foot, their use may result in nail damage, toe injuries, and even stress fractures after frequent wearing. The point of this discussion is that people should choose their shoes wisely. One must keep in mind the real need for shoes. Fashion for the sake of trendiness is an unavoidable reality in our culture. However, it really should be the last thing to consider when selecting any type of shoe for regular wear. There are shoe types out there that are fashionable, yet still sensible and able to provide for the basic requirements of what a shoe should offer the foot. By putting fashion last, one can make a much better selection, and end up with more comfortable feet that stay injury free. If you have questions regarding what type of shoe is best for your own individual foot structure, the podiatrists at Indiana Podiatry Group have the answers. Call us to set up an appointment for an evaluation and recommendations on how to keep your feet happy and healthy.